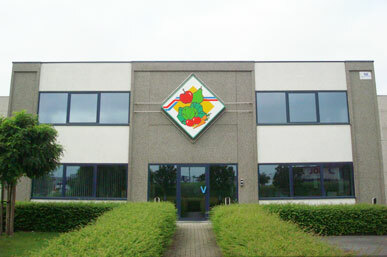 The history of the firm VERVAEKE Ltd started in 1954, when after having been in the army mister Antoon Vervaeke started selling the vegetables his father cultivated. In a short time, two commercial routes were developed in West Flanders. After a few years of experience, it became necessary to buy warehouses on the wholesale trade market of Ghent and Kortrijk. Under the direction of mister and miss Antoon Vervaeke, the range expanded in no time: they achieved to obtain a whole range of fruit, vegetables and exotic fruit. In 1965 we started the export of fresh fruit and vegetables towards France. The firm VERVATRANS was founded during this period, in order to allow transportation between our firm and our clients. This firm has several vehicles especially equipped to transport vegetables and fruit. In order to respond to our clients’ demands, a warehouse was built in 1980. This warehouse disposes of 3.000m² of storage accommodation and 2.800 m³ of cold storage. The entire property (office and warehouse) is located at the I.Z.LAR, 500 meters from the motorway E17 and about 2 km from the border with France. In 1984 mister Christian Vervaeke joined the firm, and this entailed the start of the third generation. The purchases take place either at the stock in Belgium and the Netherlands, or at home through a sophisticated computer system. We also import from Germany, Italy and Switzerland. For several years now, we have clients all over the world and our greatest trump will always be: a flexible, quick and efficient settlement of the orders. Are you interested? Please let us know. Christian and Antoon Vervaeke will always be at your disposal for further information. You can reach us through our contact-page.